Last time we discovered that our faith grows when we learn how to worship God in Spirit and in Truth (John 4: 23 – 24). This means you can worship him through your spirit no matter what you are doing (a real secret of contentment). You have turned your heart and spirit into a temple of worship. To worship God in truth means that we are truthful about whom we are. Once you realize in your heart who God is to you, (as your Father), you can choose to worship Him without unneeded issues getting in the way. Can worship be involved in other ministry? Yes! Worship of the Lord should be at the heart of ministry towards others. After all, we are the hands and feet of Jesus – we are the Body of Christ. He ministers through us. So we must be rooted and grounded in God, and filled with his love and compassion. We can’t minister in our own power – it must be his love, not just ours. We simply are too frail on our own. Recently, I was watching Heidi Baker minister in a church service online. It was the Sunday following the Women on the Frontlines conference in Phoenix, Arizona (March 2014). Heidi shared of the importance of spending time in worship with the Lord. That precious time is like the oil of the wise virgins (Matt 25: 1-11). Remember what the Lord tells the foolish virgins (who didn’t have their oil)? “Assuredly, I say to you, I do not know you.’ This means they did not spend TIME with him. When we spend that time with him, we are able to minister in the Holy Spirit’s power, but also with the love and compassion of Christ himself. This has happened with me on the mission field as well – I have spent time in soaking prayer before the Lord. He has been gracious to fill me each time with love and peace for myself and much more for others. But it was most important just to spend time with God for who he is. We need to be like Jesus with skin on for those who are needy. Sometimes we have seen Jesus in others, and sometimes he is evident in us. When I attended another women’s conference in Phoenix (January 2010), that same Heidi Baker approached me in the midst of the worship time. She was filled with love, and it was like I was looking at Jesus through her beautiful, loving face. She hugged and kissed me, and handed me a beautiful bouquet of red roses. We didn’t speak, but I sensed that God was touching me very deeply through Heidi’s gesture. I was told by her helpers that those were her roses, but she was led right to me to give them to me. I’m still unpacking what that meant. But in a sense, it was like she was passing on a mantle to me – since I really felt akin to her in missionary ways. That call is becoming clearer with time. Fast forward four years to the Sunday service where Heidi shared about the oil being the time with God. This is a lady who spends four to six hours daily in deep worship. She said that she receives best when she worships lavishly with the Lord and feels badly when she needs more time with him. But the Holy Spirit spoke to her heart that when she is holding a dying child or ministering to a lonely widow, she is also worshipping him. This is another aspect of Matthew 25 (Unto the least of these!). So worship and ministry are definitely interconnected. 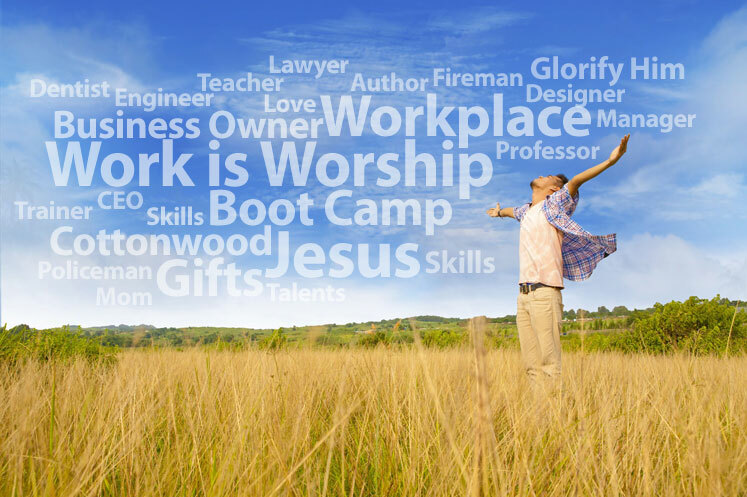 Could one worship and work in a secular workplace? You bet! The Apostle Paul encourages us to pray without ceasing (1 Thess 5:17), and if we follow Brother Lawrence in practising the presence of God, we are doing this. We can hum worship songs while we work, and at times, we can even pray in tongues under our breath. But how about using our secular work as an opportunity for pastoral care and mercy? There are times when acts of kindness speak deeply of God’s compassion. Customer service as a retail worker can become pastoral care. Personal financial planning done by a compassionate, conscientious Christian can be an opportunity for pastoral care and evangelism. Reformer Martin Luther believed that secular work could be a lay person’s calling, as important as that of a member of the clergy. A layperson’s job is not something separate from faith, any more than hands are separate from mind and heart. Devoted work is the very flesh and bone of living faith, without which worship cannot live and grow. Whateveryou do, wherever you minister, you are called to serve Christ where you are. The Apostle Paul reminds us that ‘Whatever you do, whether in speech or in action, do it in the name of the Lord Jesus’ (Col. 3:17). Quite often, these folk minister through divine opportunities, and of course can also be a good witness by their presence. Remember what Paul told the Christian slaves: “Obey your earthly masters in everything; and do it, not only when their eye is on you and to curry their favor, but with sincerity of heart and reverence for the Lord. Whatever you do, work at it with all your heart, as working for the Lord, not for human masters, since you know that you will receive an inheritancefrom the Lord as a reward. (Col 3:22-24) While we aren’t slaves, we are bound to our employers to give our very best. And when we go beyond that, it points to the Lord. Some of you may be called to be a ‘tentmaker.’ A tentmaker is a layperson who works as a volunteer for the church – either in missions or work inside the church, but they are supported by a job outside the church.This is what Paul did when he travelled on his missionary trips. Though he was a trained leader, he made tents to pay his way wherever he went. This is a special calling. This work that is done for the Lord is a gift to Him, which he honours. Though God will work through all of us, these lay people are available to do ministry in ways that full-time professional people cannot. The professional people have to minister within their jobs. Clergy are in ministry too, but they are committed to a certain kind of ministry, which includes encouraging you in your own ministry. They can’t go out like you can… and we lay people have an advantage: since we are volunteer, the people receive our ministry as a gift. It is a beautiful, sweet smelling gift that Jesus accepts, and the people receive. It is how we minister and how we choose to use our gifts that matters. We have the same Holy Spirit, but how we touch others is unique to you and the Lord. The Apostle “Paul chose how he ministered the gospel.” [R Paul Stevens Liberating the Laity: Equipping All the Saints for Ministry. Downer’s Grove, Il: IV Press, 1985. p 42] He sacrificed being paid for his ministry, he sacrificed his time to love people into the kingdom of God. He sacrificed some of his sleep and ministry time for his job so that he could give himself as a gift. “All genuine ministry comes out of sacrifice.” [Elton Trueblood. Your Other Vocation. New York: Harper and Brothers, 1952. p. 59]. So also true work and true ministry comes out of worship. Next time I will share how we can grow in God through pilgrimage.